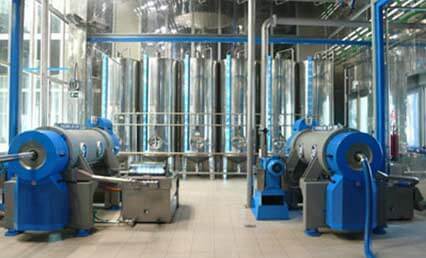 Decanter centrifuges are used to separate solid particles from liquids. Depending on the fluid being processed, the flights of the scroll in the centrifuge can see extreme levels of wear. Only FEROBIDE gives OEMs a wear protection material which performs as needed without suffering the common limitations experienced with traditional materials. Prior to introduction of FEROBIDE, traditional tungsten carbide had become accepted as an industry standard for protecting centrifuge flights. The major limitation of tungsten carbide is that the material requires specialist brazing to a steel carrier before being mounted to the centrifuge scroll. Brazing is a weaker joint than welding and the industry faces large problems with tile delamination, braze corrosion and breakage, resulting in damage to the centrifuge bowl. FEROBIDE overcomes this issue by being directly weldable to the scroll. The reliability of a weldable material gives “peace of mind”, particularly in the separation industry where high speeds are involved. This ensures that long-life FEROBIDE withstands high impacts, and protects the flights during its full life. Equipment manufacturers and refurbishers alike benefit from a wear resistant yet tough material to avoid problems with chipping and to increase the overall wear life of tools.